On the feast of the Venerable Bede, I'm reminded of my undergraduate course in Anglo-Saxon, which my inimitable (and favorite) professor Dr. Sheets proudly noted was the only undergraduate level course on the subject offered in the Eastern US. One of our study documents, of course, was Bede's Ecclesiastical History translated into the vernacular Old English in the days of Alfred the King. I can still recite Cædmon's Hymn, the story of which Bede recounted, and which the class had to memorize. When it came to writing an icon of Bede, I found a dearth of available models, particularly given my interest in trying to write icons that look like "real people." Then I remembered Dom Bede Griffiths, the great Benedictine namesake of his progenitor, and the image clicked. Bede, through you we honor all historians who labor to preserve the traces of our past. 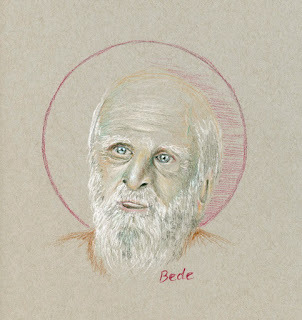 Splendid icon of Bede, Tobias. You must do a book with the icons and brief biographies of the saints. Thanks, Mimi. I've had that thought. Perhaps I'll start with a calendar, with just 12, and then branch out! W., yes, I think that's why it was such a point of pride for Dr Sheets, as most of the IV league had begun to phase out such classes. I assume the only reason my alma mater had the course was due to the presence of the good teacher, rather than any commitment to antiquarian interests. Dr Sheets also loved to recite, and did so beautifully, though with his restrained Virginia Gentleman accent; he also gave a blessing on my reading, which was a high honor, and declared that I was "Ælfric redivivus!" He was a wonderful teacher, bringing in much more than just the language -- the culture and the sociological and philosophical issues. I recall he used the opening of Bede's History to describe the difference between a paratactic and hypotactic linguistic style, as reflective of worldview! Hmm. I may be a bit older than you, but in 1976, I took "Old English" at UMd (College Park) and there, on the first day, met my wife of (now) 33 years. And Caedmon's hymn remains one of my favorite OE passages. Actually, Peter, you're a tad younger than I. I was in the class of 71, and took AS (OE) I think in my junior year... Maybe Sheets students inspired a spread in MD -- he was at Towson.